Oct 1, O-14-28 was introduced at the Highlands Council Meeting asking for Valley St by RT 36 be made one-way from Highlands Ave to Rt 36. Oct 22, O-14-28 was opened up for public comments and voted on by the Council. Nov 5th the change was made with signs being erected. Nov 7th drivers were complaining about the change in traffic pattern because they had no expectation that it had happened and had a near miss trying to turn where they had always turned. Step 2: Council agrees to consider and sets a time to discuss and have a public comments portion. Step 3: Town mails out proposed ordinance to all residents 200 feet from road in question similar to what has to happen with zoning changes. Step 4: Council considers passing ordinance after residents are noticed and provided an opportunity to voice their opinion during the public comment section. Step 5: Council votes yes or no on proposed Ordinance, and if yes, sets a timeline for when it changes. Step 6: Town puts out notice that change is coming and communicates when traffic pattern will change. i.e. media http://bit.ly/1wmtpSb, signs on Rt 36 warning that Valley will be one way starting “Nov – whatever”, sends out email blast, etc. Step 6 NEVER happened. I live on the corner and the only reason I knew is because my son saw them putting up the sign and called to tell me. #3 didn’t happen either, this above is what makes sense to me the process should have been. Does anyone know the reason why this change was requested? 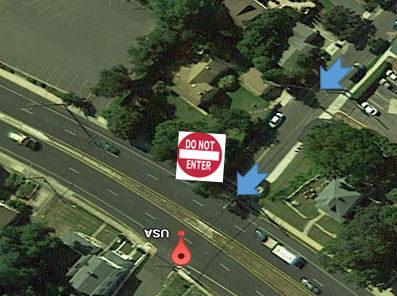 It doesn’t seem like it is a high traffic area to warrant a one way. There were 17 or so accidents at that corner over the last 16 years. The homeowner brought it to Council. It’s a dangerous turn when you are going from 50 MPH to 25. I wish more people would attend council meetings.